The club invites everyone to come take part in our Rugby Funday to be held on the 11th May. The BBQ will be lit at 12.30 and burgers will be flipping from 12.45! 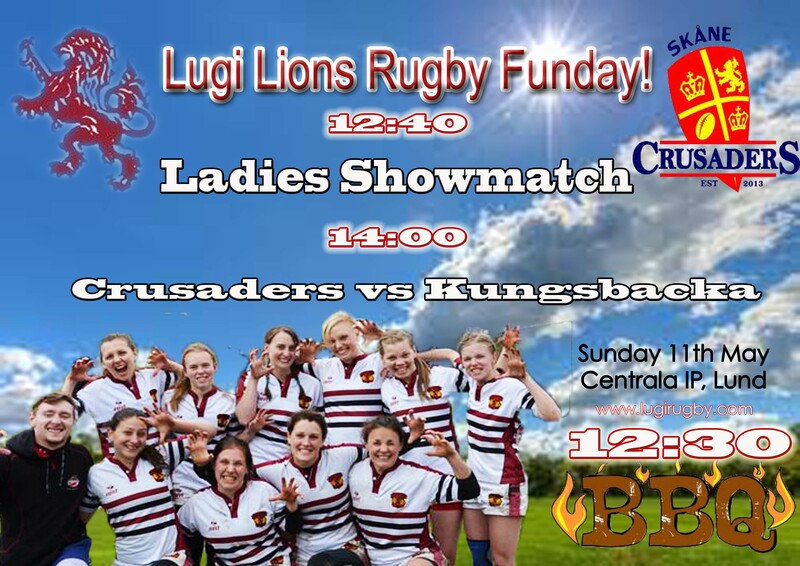 At 12.40 the ladies team and old boys will play a promotional game, before the Skåne Crusaders take to the pitch for warm up their warm-up at 13:00. Then at 14.00 the Skåne Crusaders will face off against the Kungsbacka Broncos. We’ll make sure the kiosk is full of yummy treats and that there are burgers all around, so come on down and enjoy a lovely day by the (hopefully) sunny pitch and show all your family and friends that rugby is a sport for everyone – no matter age, form or gender! Head over to our Facebook event and let us know you’re attending – here! See you in the sun! And remember, Sunday is funday! And that is rugby! This entry was posted in Festivities, News and tagged funday, rugby on April 28, 2014 by Ross. The third of four SM 7s 2014 qualification rounds saw our ladies head down to Trelleborg to compete in the tougher of the two groups against Kalmar, Pingvin and Vänersborg. 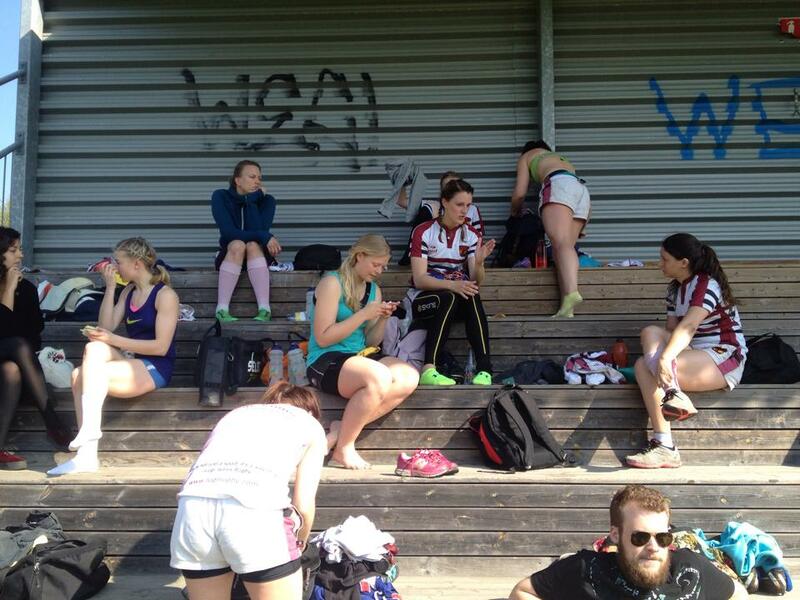 Despite some early travel issues when Malin’s car decided it needed a new axel, the girls arrived on time and ready to enjoy the rugby as well as the scorching sun. Having talked about starting fast in the trainings leading up to the weekend, the girls not only achieved this, but put Kalmar to the sword in the process with a huge score of 39-0. Despite the Kalmar side being a bit weaker than the one we lost to 7-0 in the Gota Series, it’s doubtful the result would have been any different if they were at full strength with the way our ladies dominated the match from start to finish. Martina Vivlund scored early and often as she was the beneficiary of some great teamwork as well as using some of her own individual skill to score five trys in the game. 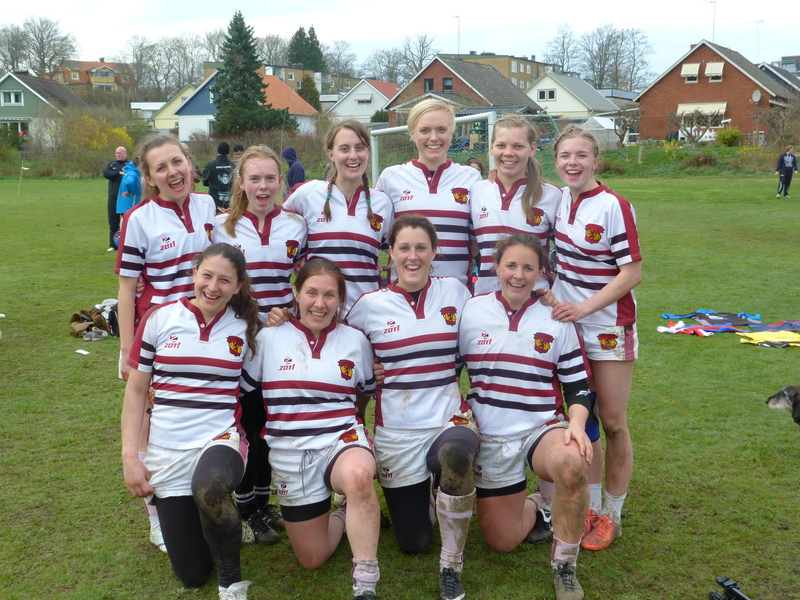 After a little time off, the girls prepared to take on the hosts, a young side who have been coming on leaps and bounds recently and had beaten the other group competitor, Vänersborg, 21-10 in their first game of the day. The scoreline when all was said and done was a disappointing 39-0 to Pingvin, but on reflection it was a fairly even contest in the first half before the second became a whitewash. The first half was very tight with our girls competing well and only a couple of defensive mistakes letting the home side finish the half 12-0 ahead. Despite our earlier scoring capability, the team just couldn’t find the holes in the Pingvin defence, and combined with a lack of fitness weakening our defensive efforts, lead to the home team really asserting their authority and running away with things in the second half. All the days images can be found here. Our final game of the day came against a team that has traditionally been somewhat of a bogey side for the ladies, Vänersborg, who play a somewhat more “physical” style of rugby. However, this was not the Lugi team of days past where a crushing defeat the match before would lead to subsequent poor performances. Instead, the ladies put on a very good performance, being stingy in defence as well more structured in attack, never giving Vänersborg a sniff of hope and seeing us run out winners 22-5. The highlight of this game was our final score of the contest, a lineout move straight from the training ground, which whilst it may not have gone the legal five metres, was pleasing to watch as Mican romped 40 metres down the pitch before offloading to her support runner Ana who dotted it down over the line. Overall it was a pleasing day with two very convincing performances, but it also highlighted some areas that need to be worked upon in the upcoming weeks before the second round of the Gota Series as well as the next round of qualification games. The results on the day now leave the ladies lying in second position in the SM South qualification series, with only four teams qualifying for the finals in Borås. The final round of the qualification series takes place in Växjö on the 31st of May where a respectable result should see the ladies qualify for the finals. This entry was posted in Match Report and tagged Lugi, rugby, sevens, SM 2014, womens on April 27, 2014 by Ross. 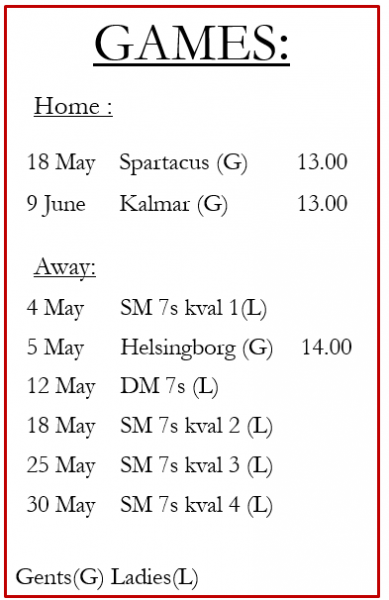 The first round of this year’s Gota Series saw ten Lionesses travel up to Ronneby to take on the hosts, Kalmar, Wexiö and Borås in the shortened version of the game. Along with our new players Amy and Sandra excited for their first ever rugby action, captain Mican couldn’t wait to get back onto the pitch after a long rugby lay-off to rehab her shoulder. 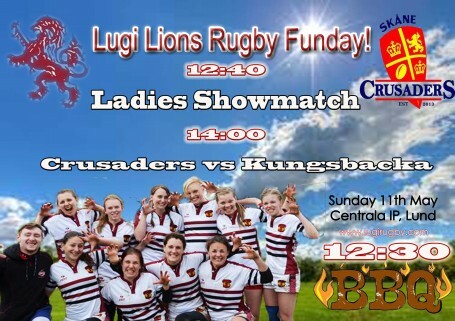 The footage from each game is included below in this report, but overall the ladies put together a great day of rugby despite being a little undermanned and with a couple of players ailing for various reasons. Our traditional slow start saw us drop the first game in a tight contest against Kalmar, a game that I know the girls would like back and which on another day, one which we would have won. The main takeaway from the loss was that it wasn’t our structure that was the problem, but just a little bit of inexperience and execution problems at the business end of the game that let us down, something that we will only develop with time. However, from that loss, we responded by playing some fantastic team rugby throughout the rest of the day, with the highlight being our support play, a key in the game of sevens. The work rate of every girl meant that the scores were shared out fairly evenly across our team and being one of the reason why we ran away somewhat with the games against Ronneby, Wexiö and Borås. Whilst the competition is not the toughest we will face in Sweden, the standard on the day helped us ease our newer girls into action and is a vital tune up before the next SM qualifying round on the 26th April in Trelleborg. The girls can be very proud of all their performances and deservedly went home with huge grins on their faces and lots of Lugi Kärlek in their hearts. Team: Malin Andersson, Olivia Maunsbach, Sandra Olofsson, Amy Rice, Linnéa Roslund, Mican Rydén, Elizabeth Sonnenholzner, Anni Törhönen, Anna Thynell and Martina Vivlund. This entry was posted in Match Report, News, Women's Team and tagged borås, Gota Series, kalmar, Ronneby, sevens, wexiö on April 13, 2014 by Ross.